Nikola Dragaš was born on September 15th, 1981 in Pancevo, where he still lives. He graduated in 2004 at the Higher Polytechnic School in Belgrade, majoring in graphic design. He works as a graphic designer at the Post Office of Serbia in Belgrade. He is a member of The Association of Applied Arts Artists and Designers of Serbia (ULUPUDS) and The Association of Cartoonists of Serbia (FECO). 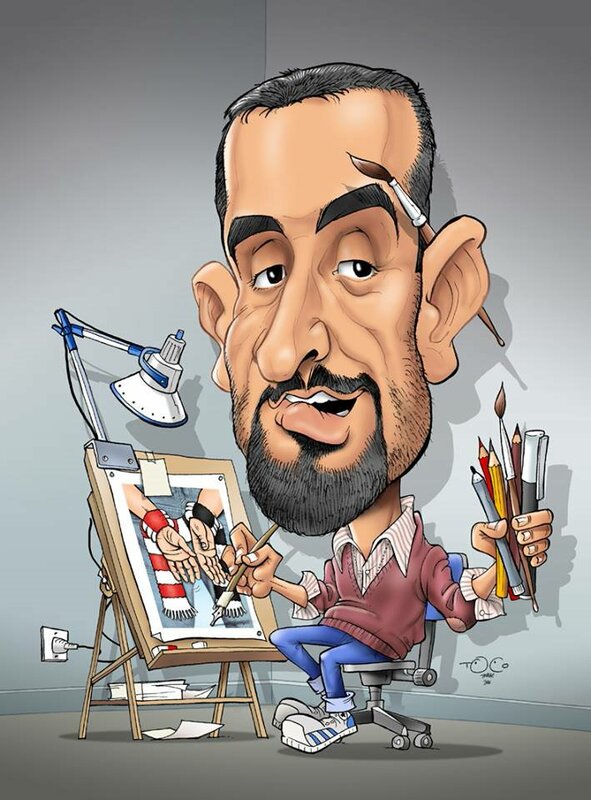 Caricature, children's illustration and graphic design are the areas of his work. He also illustrates children's books and textbooks. His illustrations and caricatures were published in the newspapers “Večernje Novosti”, “Politika” and “Jež”. He is a regular participant in the national and international salons and exhibitions of caricatures, cartoons and illustrations such as “Pjer” (Pierre), “Zlatna Kaciga” (Golden Helmet), “Zlatni osmeh” (Golden Smile), “Zlatno pero” (Golden Pen), “Majski salon ULUPUDS-a” (ULUPUDS May Salon), “Osten”, “Balkans Festival of Young Comics Creators - Leskovac”, “Biennial of Ecological Cartoon Sokobanja”, “Krajiški salon”… In addition to his work, he is dedicated to books, family, and especially his children Dunja, Strahinja and Staša. The exhibition of children's artwork, Pančevo City Library, October 2015. The exhibition of children's artwork, Primary School “Prvi maj”, Vladimirovac, November 2014. The exhibition of children's artwork, Gallery “Boem”, Starčevo, September 2014. Caricature Exhibition at the Festival of Humor and Satire "Laloški šešir" in Timisoara (Romania), June 2014. Caricature Exhibition at the Festival of Humor and Satire „Satirična pozornica Žikišon”, Paraćin, November 2013. Caricature Exhibition, Youth Center Pančevo, Pančevo, January 2013. Caricature Exhibition, House of Culture „3. oktobar”, Banatsko Novo Selo, December 2012. Caricature Exhibition at the Festival of Humor and Satire „Žaoka” in Kačarevo, November 2012. Caricature Exhibition, Pančevo City Library, October 2012. The exhibition of illustrations as a part of "One Hundred Years of exhibitions of handicrafts, agriculture and industry in the National Garden in Pančevo", Coffee shop, Pančevo 2005. Exhibition of drawings by Nikola Dragaš and Vladimir Ninić, „Svi čitaju Pančevac 2”, Pančevo 2005. The prize in the competition for drawing on the theme of "Coffee and imagination can do anything", Belgrade 2015. Third place for the caricature „Čivijada”, Šabac, 2013. Second place for the caricature at the International "Street Art Festival", Kraljevo 2013. Shortlisted in the competition for the caricature “Serbia and EU”, Belgrade 2013. Diploma for the caricature at the International Festival of Humor and Satire „Zlatna kaciga” (Golden Helmet), Kruševac 2013. Second place for the caricature „Kucurski klip”, Kucura, 2012. Second place for the caricature „Čivijada”, Šabac, 2011. Special Award for the illustration, ”Take a look”, Pančevo, 2008. Award for the illustration, Vojvodina Green Initiative Contest, for the theme "Who's Afraid of the Big Bad Wolf", Novi Sad, 2006. Award for the illustration, Vojvodina Green Initiative Contest, for the theme "Where Disappeared Pine Forest Overnight", Novi Sad, 2005. Second place, The competition of the Red Cross, Belgrade, 2002.